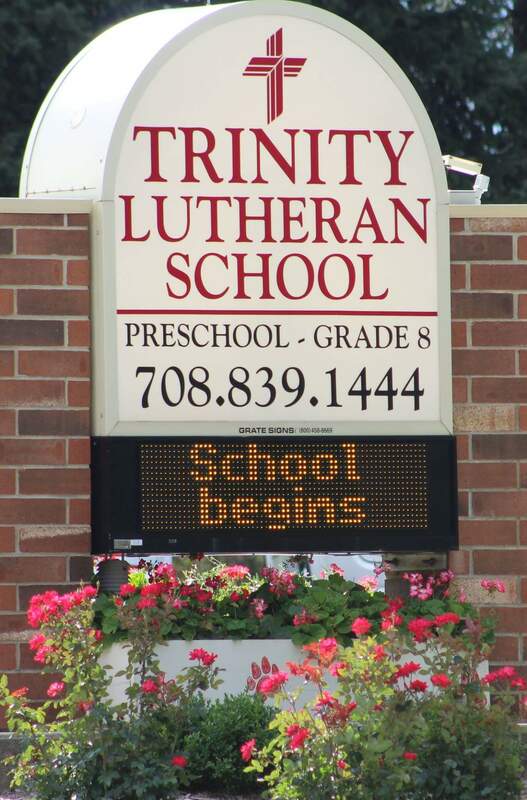 Since 1865, Trinity Lutheran School has been preparing students from many cultures and religious denominations to succeed by promoting excellence in every area of scholastic achievement, and centering education on a personal relationship with Jesus Christ. One way that Trinity accomplishes its mission is through our Christian Day School. Our teachers share the Gospel of Christ every day while teaching elementary subjects for two-year-olds through eighth graders. The students include members of Trinity Lutheran Church, members of other Lutheran churches, and children from the surrounding communities. The school is fully accredited by the Lutheran Church-Missouri Synod, the Northern Illinois District, and fully recognized by the State of Illinois. We complete a rigorous accreditation evaluation by the LCMS every 5 years in order to maintain accreditation status. An independent review committee evaluates our facility, our staff, and our academic programs in order to make sure that we are maintaining an up-to-date curriculum and facilities, as well as implementing new curriculum as required by the state of Illinois. In addition to a complete elementary course of study, extracurricular activities in speech, instrumental music and athletics are offered. ​Trinity students include members of Trinity Lutheran Church as well as members of other Lutheran and non-Lutheran churches, and represent many different cultures. Members of all faiths are welcome! Trinity families live in several different neighboring communities: Lemont, Darien, Woodridge, LaGrange, Hickory Hills, Justice, Willow Springs, Burr Ridge, Plainfield, Joliet, Tinley Park, Chicago, Palos, Homer Glen, and more. The students attend various high schools, too: Hinsdale South, Hinsdale Central, Lyons Township, Argo, Stagg, Lockport, Walther Lutheran, Chicago Christian, and Lemont. In 1865, Pastor G.M. Zucker from Proviso, assisted in the organization of Trinity Evangelical Lutheran Congregation, U.A.C. In the same year, the first church building was erected and dedicated on the third Sunday of Advent. Pastor Theo. Mertens was called as pastor and installed on the 18th day of March, 1866. A great blessing had therefore been showered upon this community, namely an organized congregation and preaching services every Sunday, as well as the administration of the Sacraments. His successor was Candidate Karl Trautmann from the Concordia Seminary in St. Louis. In 1881, a parsonage was erected. In January 1883, Reverend F.W. Brueggemann became the pastor of this congregation. During his pastorate the congregation grew to such an extent that a teacher was called for the parochial school. The congregation then called Rev. Hugo Schwartzkopf. During his pastorate the congregation, with God's blessing, continued to grow and prosper. The first house of worship became to small. Accordingly, the five acres lying south of the original property were purchased and on it a new church edifice was erected at the cost of $6,229.87. On June 9, 1924, during a severe electrical storm, the church was struck by lightning and burnt down. The congregation was then forced to worship again in its original church building. On the 12th day of July 1925, it was resolved to build a new church, and already in November of that year, the corner stone was laid amid great rejoicing. On May 16th of the following year, the new church building was dedicated to the Triune God. In 1936, it was resolved to build a new school, that the Christian education of the children might be re-established. Accordingly, a school was built at the cost of $5,500.00 and dedicated on the 6th day of December, 1936. The present church building was dedicated April 4, 1971. The present school building was dedicated in 1983.